During the workshop you will learn how to design stable analog and digital control loops in both voltage mode and current mode. You will then design, code, implement and test several digital power supplies in our well-equipped laboratory. In addition, during the 4th day we will cover advanced digital concepts such as digital PFCs and and multi-loop converters to keep your knowledge up to date with the latest developments in power supply technology. The workshop is four days long and is aimed at analog PSU designers and embedded systems engineers who need to design high performance stable digital power supplies or wish to advance their knowledge for personal development. We finish slightly earlier on the 4th day to allow easy travel specially for guests needing to get to the airport. First the engineering concepts, theoretical material, step-by-step design procedures and power supply design equations are taught in the class and then these are all put onto practice with numerous laboratory exercises on real digital power supplies. The workshop manuals contains hundreds of pages of slides and comprehensive laboratory manuals. All labs are based on TI's industry leading C2000 range of MCUs but the design practices taught in the class can be applied to any MCU. The participants will work with no more that 2 engineers at a workstation. Our lab is extremely well equipped with 10 workstations. Therefore the maximum number of attendees is strictly limited to 20 engineers. Each workstation contains laptop with relevant development software, SIGLENT SDS2302X oscilloscope, power meters, current probes and a host of digital power supplies and PFC teaching kits. Bode 100's network analysers will be available for demonstration of stable loop measurement. ​Typically the morning session is dedicated to the study of theory and principles, whilst the afternoon session focuses on laboratory exercises to consolidate the theory. 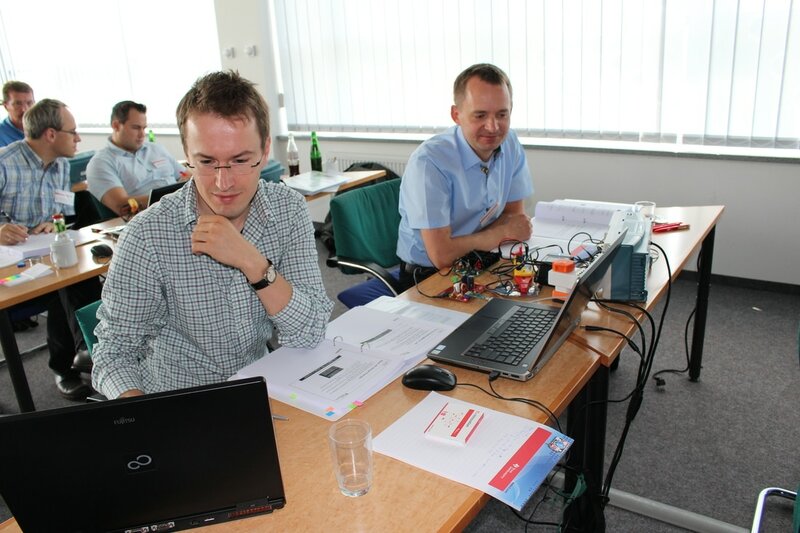 Learn how to design and stabilise single phase and interleaved digital power factor correction systems from ground up quickly and easily during this in-depth laboratory based day. During this day we will start from basic principles and cover the entire design, loop stabilization, meeting the regulations and component selection. To verify all of the theory, in real life you will then implement your digital PFC design in our well-equipped lab. Join us a day early for this one day technical seminar covering the fundamentals of control theory for analog and digital control systems. This optional and free seminar is presented by Richard Poley of TI. More information can be found on his Control Theory website. This seminar is only available on selected workshops in the US. You will be given an opportunity to sign up during the workshop registration process. * 6 months trial license. You must have unrestricted access to internet. This software is not necessary for understanding the material in the class and available on request. ​​The class runs from 9:00am - 5:00pm on Days 1 and 3. The audience should have a degree in electrical / electronic engineering, computer science or equivalent. "I highly recommend this workshop for engineers interested in an introductory class on digital power. I now have the ground work to read white papers on Digital Power to further my education." "This was one of the best workshops of any kind that I have attended. The class content was very informational and the labs were engaging." "This course provides a good over-view of the theory and then allows student to submerge into the practical designing aspect of a digital power supply. Very enlightening and powerful course." "This is an excellent, solid, theory based seminar. It takes the mystery out of digital control." "There are few instructors or workshops that clearly and efficiently present a continuous stream of valuable information. This is one of the best workshops I have attended in years and I left each day looking forward to the next. Outstanding material and presenter." "The workshop has cleared the confusion surrounding what is possible with digital power and how to implement it. I will use this material to develop digital power solutions for automotive applications." "The material is supported by many practical examples and tutorials, and includes a brief question and answer session at the end of each section." "It was extremely useful hands-on practice orientated workshop, helping understanding in-deep design challenges." "The workshop is very informative and interactive. You just don't dig in to the theories but get a real feeling by doing hands-on lab."